Well I’m a bit behind schedule… I missed an update so I have a lot of ground to cover. Therefore I’ll be sticking to the highlights of the highlights. In addition, I want to point out that the City is now putting out a summary of council meetings after each meeting. Here’s a recent example. So if you’re looking for a high level overview of what we covered, you can find those on the City’s Facebook Page. This is an initiative of our new Communications Director, who has been doing a great job with our social media channels and city events. This recap covers the Charter Commission Meeting on September 17, Work Sessions on October 1, 6, 8, and 20, Council Meetings on October 6 and 20, and West Metro Fire Board Meeting on October 14. Code Review Task Force Report – The council received our first report from the Code Review Task Force, covering the changes they are suggesting for the first few chapters of the city code. The task force had a number of recommendations for how to restructure the code to make it more usable, as well as some changes to ordinances found in the first few chapters. The council now has to take up and discuss the proposed changes. We will be tackling changes to content as the task force goes forward, and we’ll implement all the structural changes at the end of the review. Advisory Commissions – The council has been discussing changes to our advisory commissions and have decided upon a strategy for next year. All the commissions will remain, but we’ll be making some structural changes to the city code to allow for future flexibility in adding or changing commissions to meet changing needs. Probably the biggest change is to move to an annual process for recruiting and interviewing commission members instead of the piecemeal process we currently have. Capital Improvement Funds – The council discussed a different approach to accounting around capital improvements in the city. This will lead to a more transparent and easier to understand budget by breaking out operations (payroll, insurance, office supplies) from capital improvements (new trucks, water pipes, etc.) We also continued the discussion on how to move toward paying for street maintenance through the levy instead of street assessments. Bassett Creek Trail – We received an update on the Bassett Creek Trail that Three Rivers Parks is constructing in Crystal and New Hope. We are seeking more input from affected residents so we can minimize any negative impacts from the trail. Quiet Zones – The council approved a plan from city staff to hire an engineering firm to study the feasibility of implementing Quiet Zones for train crossings in Crystal. This would mean that freight trains coming through Crystal would no longer blow their horns at crossings. The study is the first phase in what will be a long process, and will help us get an accurate cost estimate for what it would take to complete this work. 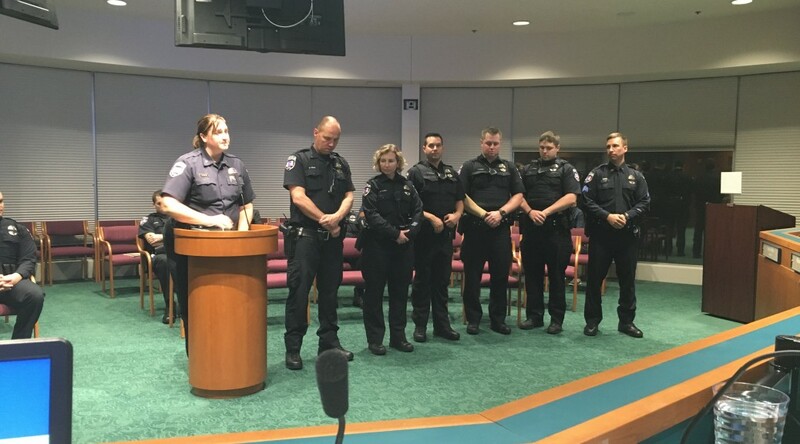 Police Department – The mayor swore in two new officers, and Chief Revering presented a number of commendations and medals to members of the PD for their work in the Barway Collins Case. The Patrol Division officers who earned commendations are pictured above. Chief Revering also won an award for her work in the case. Street and Alley Reconstruction – We took a number of actions related to Phase 14 and 15 street and alley reconstruction projects. Budget – We held an extra public hearing beyond what is required by law to solicit feedback on the proposed budget. The budget process will continue through the end of the year. Tobacco Violations – We set a civil penalty for Liquor Barrel Wine and Spirits, who recently sold tobacco to a minor. After discussion the council settled on a one day suspension of their tobacco license, and a $100 fine. This is less than the maximum allowed under ordinance, but an appropriate penalty based on the facts of the case. New Businesses – We approved a Commercial Kennel License for Pet Supplies Plus, a new pet shop opening at the Crystal Shopping Center, and a conditional use permit for a new business that’s opening in the old Thriftway building. That will be a hardware store, a deli with a drive through, and a thrift store. I’m very excited to welcome all of these new businesses to Crystal! The Charter Commission continues to look into Ranked Choice Voting, a confusing and expensive alternative to the way we vote now. Action on RCV by the Charter Commission has been officially delayed until after the 2016 elections, but the commission continues to discuss the topic. I continue to oppose this method of voting, which has been shown to disproportionately disenfranchise minority voters. I serve as Crystal’s council representative on the West Metro Fire Board. This month we continued our strategic planning, with a focus on what the structure of the District should look like in the future, discussed options for how to deal with our aging Aerial Lift, and discussed then deferred action on proposed updates to the District’s grievance process. I asked for a continuance in the grievance process so I had an opportunity to more fully study the issue and get feedback from the firefighters who would be using it. 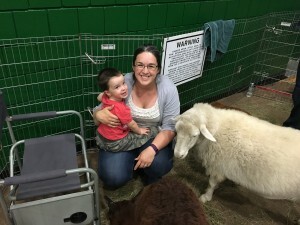 Barnyard Boogie – I checked out the Barnyard Boogie with my Toddler. It’s an event at the Community Center that includes a dance and a petting zoo, and it’s awesome. Next year, find a kid and check it out. Halloween at Crystal Shopping Center – Another dance event for kids (sensing a theme yet? ), this one included a costume contest and Trick-or-Treating at stores in the mall. 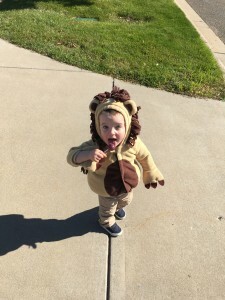 My little lion had a good time. Halloween At the Fire Station – The West Metro Fire-Rescue District is hosting their first annual Halloween event this year. They will have firefighters in costume at all 3 fire stations, so bring your little ghosts and goblins (and Frozen Princesses and Snowmen) to the nearest fire station and check out the fire trucks! Crews will also be out on the streets handing out glow sticks and glow in the dark fire hats to help keep the little ones safe and visible. More here. Light of Crystal Halfway Happy Hour – At the Crystal VFW in November. The next council meeting is November 3. You can watch the video of council meetings here and find the agendas and meeting notes here. Audio recording of work sessions can be found here. Check the city calendar for updated meeting dates, locations and times. As always, if I can be of assistance, let me know.